For the past two years our library has been developing and improving an instruction program for incoming, at-risk freshmen in a summer bridge course focused on study skills. The impetuous for improving this instruction program was the campus implementation of a Common Reading Experience. The summer bridge instructors were eager to work with the CRE texts, but were not sure how best to do so. I had been looking for ways to incorporate meaningful learning into the library visits, so saw this as an opportunity to turn a two session summer orientation into a hands-on library research project exploring topics from the Common Reading Experience selection. The research project needed to be discrete and students needed to be able to complete it during class time. Therefore, writing a paper was out. Individual work would also be difficult. We crafted a group presentation project for students to explore themes from the selected reading. Learning outcomes were identified and shared with the students in a handout. 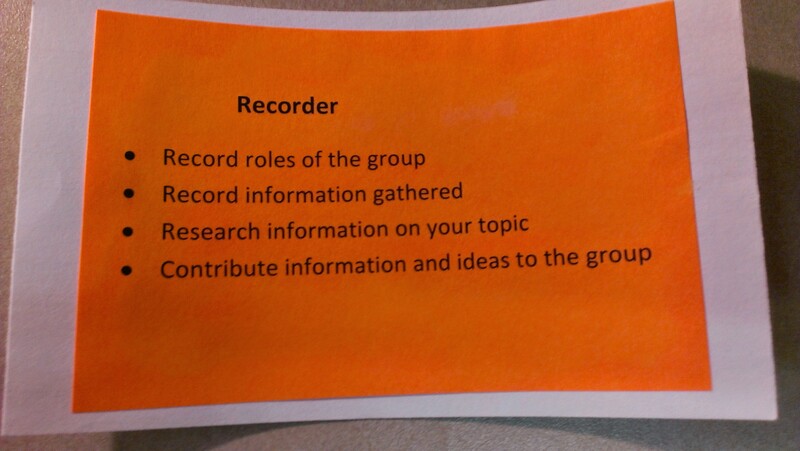 To help groups achieve their goal, we developed roles for group members- Recorder, Designer, Presenter, Project Manager- and each role was given specific duties that were communicated via an index card. The 2013 CRE selection was The Latehomecomer. During the library sessions students were tasked to work in groups of four, and examine aspects of Hmong culture, life and immigration. After investigating different aspects of Hmong life each team created and presented a PowerPoint presentation (at least 4 slides) over the aspect of life they researched. Together as a class we learned about the Hmong community in order to help us better understand the book The Latehomecomer. Applying the pedagogical principles of high expectations, student-centered learning, and peer-to-peer learning, we collaboratively designed library instruction sessions that were fun, rewarding, and personally meaningful to the students. Since our first summer running this new curriculum, we have improved the learning goals for the research project. Originally the research project sought to engage students with the CRE text through exploration of themes relevant to the ideas presented by the author. While students did learn more about these themes, they were less likely to focus on the research and sources that they consulted. This summer we are shifting the learning outcome from relevant themes to relevant sources. Students will be asked to create an annotated bibliography presentation. The presentation must include at least four slides, one source per slide. Groups will still explore relevant themes, but instead of focusing on the information within sources or the layout of slides, they will be tasked with identifying and talking about the source. This project better aligns with the summer bridge goals of understanding citation formats and using library search tools. In the presentation below, which I presented last year at Indiana University Libraries Information Literacy Colloquium, you can find out more about how we designed the workshops, assessed student learning, and improved the concept based on teacher and student feedback. Are you providing instruction or other forms of library support for the Common Reading Experience on your campus? Or do you have ideas for doing so? I’d love to hear about it in the comments below.